I'm a little slow in getting this post up, but at least I'm getting it there. Last weekend, after Amber's ordeal with her jaw injury, we still took her to the Rush concert that she desperately wanted to attend. I go every time they are in our area and drag my poor husband with me. Considering the age of the band and Amber's age, we decided to take her along this time. We have been seeing more and more children at the Rush concerts in the past years and decided it would be acceptable, if she wore ear plugs to protect her hearing. The concert was all that she hoped it would be. Thanks to some research, we knew the majority of the set list already and I was able to prepare Amber for some of the songs she may not have already known. Amazingly enough, she knew most of the songs already... lyrics and all. Perhaps I've let her listen to a bit too much Rush. The tour is a Steampunk theme, as the new album is another one of their concept albums and it is steampunk. Actually, the plot of the album has been made into a book that I'm reading right now, Clockwork Angels. At any rate, the set was a very cool steampunk design with many retro Rush visuals during the songs. Made an old Rush fan very happy. The first set went extremely well. It was songs from previous albums with the majority being favorites around here. A few reviews I read said that the band was playing some of their lesser known songs this tour and if you weren't a diehard Rush fan, then this wasn't going to be your favorite concert. Considering Amber's reaction to each song, I'm guessing she qualifies as a diehard fan (we already knew I was). The second set was largely made up of songs from their newest album, Clockwork Angels. Amber absolutely loves a couple songs from the new album and can't tolerate a few others. So, the second set was hit and miss for her. She either loved it or hated it. They did play several older songs in that set that really pleased Amber, Red Sector A being one. The encore was what Amber had been waiting for all night. I had warned her that Tom Sawyer would not be played until the end. She patiently, and towards the end, tiredly waited for her favorite. She got Tom Sawyer and 3 portions of 2112 as well. Amber loves the participation portion of 2112: Soliloquy, and Temple of Syrinx. While Fred stood there bored and tired, Amber punched her little fist in the air screaming "Hey!" at all the appropriate times during 2112. So, while Amber was still in quite a bit of jaw pain and very, very swollen. She had a total blast at her first Rock concert. 1. Yeah! Geddy is singing - Subdivisions (I think). Steampunk was the design theme, so that is a retro looking video display. It was really cool. 2. Amber and me before the concert. Amber borrowed one of my Rush concert t-shirts from the Presto tour. I'm wearing the other. Those are some of my favorite concert t-shirts. 3. Amber, ready to leave in her borrowed t-shirt. 4. Amber and Fred before the concert. 5. Set 1 - during one of the older songs. The visuals were directly from their Show of Hands tour. That was one of my favorites!!! 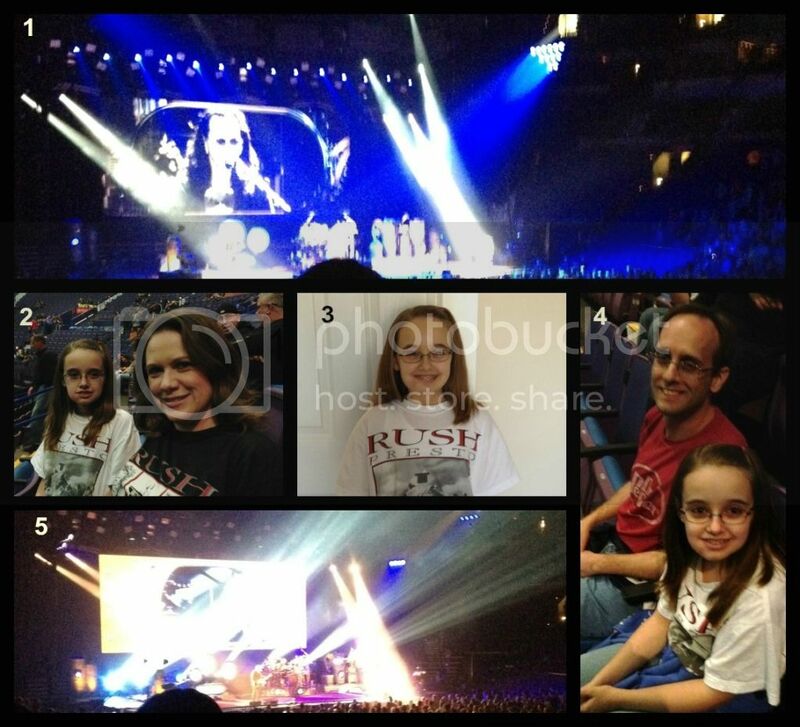 I love that you took Amber to see Rush. What an amazing experience for her Christy. The pictures are great! !